Beware of that all-too-generous email! 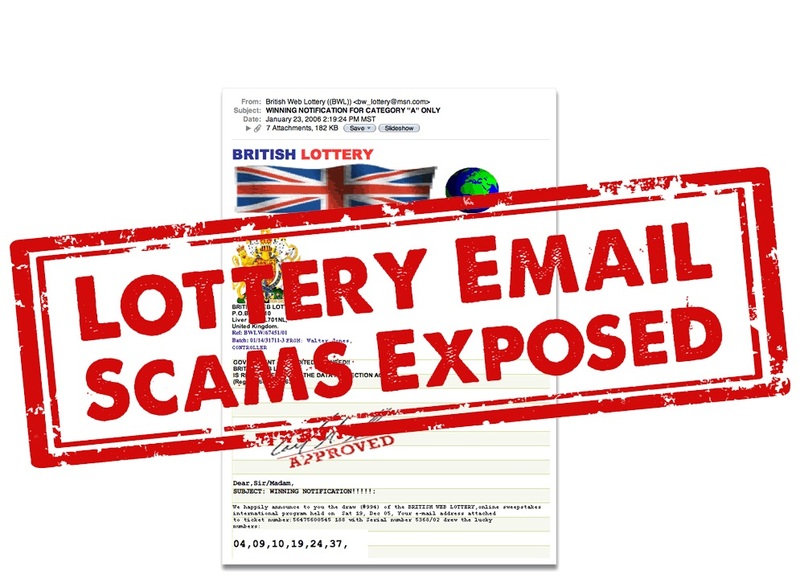 Today Lottery Exposed shows you how to spot one of the most common lottery swindles, the fake email. 2014 was a pretty busy year for tech-savvy scamsters out to make a quick buck. As usual, lottery notifications, job employment offers, disenfranchised Nigerian royalty looking to launder money topped the list of usual suspects. One would have thought fraud should be a little less obvious and one step ahead of widespread public awareness. But then you would also be surprised to know that people still get conned by such seemingly uncreative pleas, thanks largely to the strong pull of hope for the better in all of us, ever so slightly tinged with greed (admit it!). Read on and be outraged, amused and probably even disappointed at some of the most prolific lotto scams in recent time. It’s mostly old wine in not-so-new bottles. And often rather lack-lustre despite any amount of effectiveness - don’t say we didn’t warn you! The advance fee or '419' scam ('419' is the Criminal Code for fraud in Nigeria in case you were wondering!) is a 'confidence trick' which has been around as long as there has been conmen and has been worsened by the development of the internet which allows fraudsters to reach millions of people for their unlucky prey. The scamster will promise the victim a significant share in a large sum of money in return for a relatively smaller upfront fee. Unfortunately this sort of deception lends itself almost perfectly convincing unwitting targets that either they have won the lottery or that a famous lottery winner will give them a portion of their fortune for some 'help' (which usually involves giving up personal or financial information). Most often the con-man (or woman) uses the name and reputation of a real lottery organization in a notification email that happily informs the recipient of a fabulous jackpot win. The most vulnerable victims of such frauds, which more jaded users of the internet may be immune to, are those who actually enter the lotto (or at least, in some remote corner of his/ her heart, believes in sudden and unasked-for miracles) or those who are desperately in need of some almost-divine financial intervention. Even though many of us are used to this sort of con by now, you can bet that the internet swindlers are also continually refining their strategies to catch people out. The body of the message is full of spelling errors and has odd grammar, which should definitely not be the case for a corporate email originating in the UK! The lottery asks for fees in advance. This money will usually be said to be necessary to cover taxes, administrative fees, bank charges, courier fees, certificate printing, or other fabricated costs. Although this all seems to make sense at the time, it's not, real lotteries subtract all taxes and applicable fees and costs automatically before paying out the prize. There isn't a real full street address and contact information. Fraudsters often use fake street addresses, PO Boxe or do everything via email or SMS texts. The email gives the personal number of a named contact – a ‘claims agent’, even if the details mention a correct postal address and the phone number appears to be a land-line/ fax number, and the name has a fancy designation to it. Real 'lottery win' notifications do not work in this manner and are much more formal. The email asks for your personal details and bank account or credit card details outright, for a funds transfer - the transfer can very well end up involving money out of your account rather than into it! At the very least, this might lead to identity theft. The notification mentions a deadline to collect winnings, in the next 5-7 days. This is only to fuel a sense of urgency so that the victim does not have enough time to check the credentials of the sender. This is a classic sales tactic often adopted by con-artists, although lotteries often have a deadline (such as180 days) to claim prizes they do not inform would-be winners a few days before they run out. The email comes from a free email domain (eg. Yahoo.com, hotmail.com, aol.com, gmail.com, outlook.sk etc) even if the sender’s ‘name’ is, say, ‘UK National Lottery’. To find the domain name of the email id, click on ‘details’ next to the email header with sender name, date/ time and subject. The sender keeps claiming what they are doing is legal or government approved. Real lotteries don't have the need to press this point home. There are strings attached to claiming your prize. If you need to take more actions to claim a prize, be they making extra purchase or providing more personal information these are a scam. 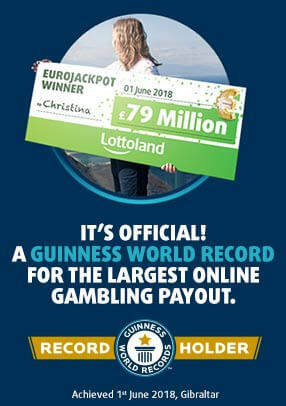 Real lotteries do not require winners to take such extra actions to claim prizes. You receive an email from a well-known lottery winner saying that they are giving away part of their winnings to you for charity. This is one of the more vile forms of the advanced fee scam since it is most effective on people who are ill or down on their luck and in need of some charity. No matter what your ailment or financial predicament this is simply not how lottery winners give away their money to charity. Any charitable donations will be handled by the financial advisors for their charity and tend to be made to causes, not directly to individuals. In any case, you will not recieve an email asking you for details or a small fee from the actual lottery winners themselves. You receive cheques for part of the lottery winnings. This is an innovative advanced fee con which takes a bit more effort on the part of the con-man but is the 'proof' many people who want to believe the scam. You'll receive a cheque for part of the lottery winnings which then convinces people it must be legitimate since we often see people collecting winnings by cheque (or giant novelty cheque!) and they will send the advance fee in order to collect the rest of the money. Unfortunately the cheques aren't real, they are either stolen or forged and will be flagged by the bank when you try to cash them. Lastly, and most importantly, if you haven’t purchased a ticket for mentioned lottery, you can rest assured you couldn’t have won a jackpot for the same! That is just not how the lottery works, even if it claims that the jackpot is through a sweepstakes by random email selection. Again there’s no such thing. If you are ever in doubt then contact the official lottery for advice. “The United Kingdom National Lottery in association with FIFA is pleased to announce to you today, of your winning in the release of its final draw of the International Promotions Programme of the FIFA-Brazil 2014 soccer world cup. The scamsters here don’t ask for details the first time around, but once a dialogue has been established with the sender, would subsequently ask for bank details and more. FIFA has denied any existence of such a lottery and debunks any relationship with the email to their 2014 or 2018 or 2022 World Cup tournaments or any other FIFA event. This is a prime and very recent example of lotteries in the name of huge global organizations, who can afford to be involved in billions worth of charity. The older version of this is the ‘Microsoft Lottery’ in the name of the Bill and Melinda Gates foundation – an authentic and widely-revered name in global philanthropy in itself. Cyber-imposters dangle the bait of a fantastic cash prize, persuade the recipient to send them money to cover courier services, UN Clearance checks, attorney fees etc and often re-contact them with delay news and more fees. “Compliments of the day, My name is Mr Colin Weir. On 12.07.2011, my wife and I won the Biggest Jackpot of £161,163,000 GBP and we just commenced our Cash/Charity Donation programme. This is accompanied by photographs of the couple, who for the record, exist in real life, and have actually won a record jackpot in the past – as a real link points out. This is a more ‘credible’ hoax, but still a scam – the Weirs are known for their charities, but they have strictly gone on record denying any random cash gifts to random email id owners. A variation to this assumes the name of the big Euromillions winners Gillian and Adrian Bayford who won £148 mn in 2012, and announces cash donations of £1,500,000 each to 5 lucky individuals and 10 charity organizations from any part of the world. The net just got wider, eh? And these guys don’t slack much either, they are pretty quick to capitalize on the most recent big winner-names, so there’s already a few of these ‘advance fee’ scam emails going around in the name of the March 2014 lottery jackpot winner, Neil Trotter as well. “We happily announce to you the draw (1117) of the UK NATIONAL LOTTERY, online Sweepstakes International program held on Monday,18th december,2006 in London, UNITED-KINGDOM. Variants use the names of big lotteries like Euromillions, Eurojackpot, the El Gordo Sweepstakes (Spanish Christmas Lottery), and even more obscure ones if it suits their purpose. This is an old trick, but one not to be taken lightly. A man in the UK was cheated of 20,000 Euros in 2004 after he decided to claim a 200,000-Euro-jackpot from a ‘Lucky Day’ lottery in Amsterdam recently. What was sadder was that his son from leukaemia, and Peter desperately wanted the money. Lesson to be learnt here – if it sounds too good to be true, it probably isn’t true!